Brown rice (36.5%), turkey meal (17.5%), naked oats, white rice (13.9%), whole linseed, sugar beet pulp, turkey gravy (2.9%), turkey fat (2.1%), alfalfa meal, pea fibre, seaweed (0.5%), omega supplement*, potassium chloride, sodium chloride, parsley (0.125%),nettles (0.125%), taurine (0.1%), chicory extract (0.1%), calcium carbonate, glucosamine (0.045%),yucca extract (0.02%), chondroitin (0.005%). Antioxidants - E306/Natural antioxidant: 182 mg, Vitamins - E672/Vitamin A: 15000 iu,E671/Vitamin D3: 1400 iu, Trace elements - E1/iron: 133 mg, E2/iodine: 3.3 mg, E4/copper: 20 mg, E5/manganese: 40 mg, E6/zinc: 385 mg, E8/selenium: 0.44 mg. Additives per kg: antioxidants: E306/Natural antioxidant. 181 mg, Vitamins: E672/Vitamin A, 15000 iu,E671/Vitamin D3, 1400 iu, Trace elements: E1/iron, 133 mg E2/iodine, 3.3 mg, E4/copper, 20 mg E5/manganese, 40 mg, E6/zinc, 385 mg, E8/selenium, 0.44 mg. It is suggested that the food be tried for a period of 3 to 8 weeks. If the signs of the food intolerance disappear, continue feeding indefinitely. 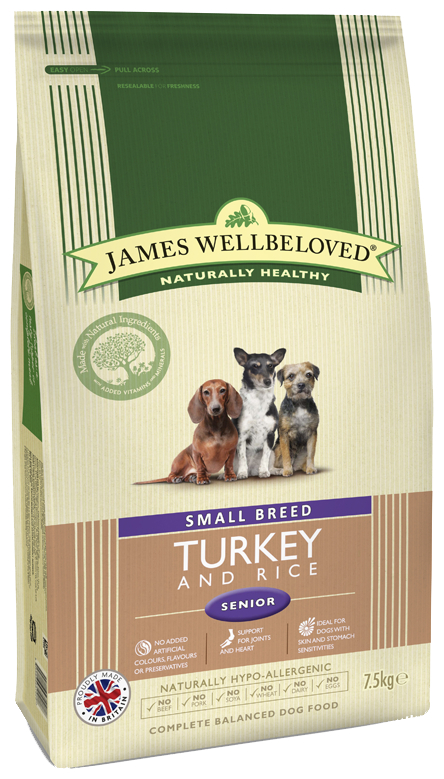 Below are some recent questions we've received regarding James Wellbeloved Senior Turkey & Rice Dog Food, including answers from our team. Turkey meal is dried turkey meat. Pre-dried meat is easier to use in manufacture and cheaper to buy, making the food more affordable to dog owners. Turkey fat is important as a source of energy and essential fatty acids. Energy has to come from somewhere. Carbohydrates are an alternative but are used to an unnatural level in most dog foods these days. Protein is the only other alternative to fats and carbs. Higher protein levels are not good in some ways either, and are expensive. Turkey fat is quite a good and useful ingredient in dog food.